identify what brings you joy, satisfaction, and engagement, and also what brings you guilt, anger, boredom, and remorse. Second is the making of resolutions, when you identify the concrete actions that will boost your happiness. Then comes the interesting part: keeping your resolutions. 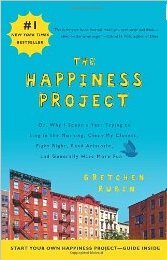 This book is the story of my happiness project-what I tried, what I learned. Your project would look different from mine, but it’s the rare person who can’t benefit from a happiness project, I regularly post suggestions on my blog, and I’ve also created a Web site, the Happiness Project Toolbox, that provides tools to help you create and track your happiness project. During my study of happiness, I noticed something that surprised me: I often learn more from one person’s highly idiosyncratic experiences than I do from the sources that detail universal principles or cite up-to-date studies. I find greater value in what specific individuals tell me worked for them than in any other kind of argument-and that’s true even when we seem to have nothing in common. In my case, for example, I would never have supposed that a witty lexicographer with Tourette’s syndrome, a twenty-something tubercular saint, a hypocritical Russian novelist, and one the Founding Fathers would be my most helpful guides-but so it happened. I hope that reading the account of my happiness project will encourage you to start your own. Whenever you read this, and wherever you are, you are in the right place to begin. I’ve been very curious about the concept of happiness for some time. So many of us seem to wallow in discontent. We’re spoiled; in my opinion. We set our expectations unrealistically high and then succumb to paralysis by analysis. For all the options we’ve been afforded through technology, social engineering and economic opportunity, to lead a "charmed life," we have failed to be “happier” in spite of it all. Even with an abundance of choices available to us (more than at any other time in history), I've started to wonder...it may seem as if having choices about what to do with your life, where to live it, how to live it, etc., is a good thing-especially for women. But is it? It sure seems as if there is a disconnect between our values, and what we think will really bring us “true” happiness. My Dad used to say, "I don't envy you kids; you have too many options." When I was a kid, I thought that was crazy. How could too many options be a bad thing? Whoever thought we’d have to “track” happiness with a “toolbox?” Maybe this is the consequence of the world we’ve created. In any case, I think you’ll find Gretchen’s book a great help and source of clarity in your own quest. It was in mine.